Home » How does the Eyot® work? How does the Eyot® work? 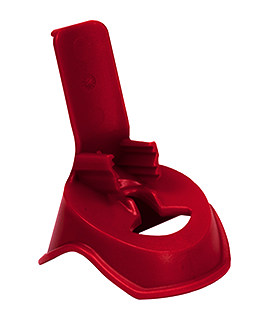 The Eyot® supports patients who use eye drops to properly and easily administer their eye drops. It can be used for eye drops in bottles, eye gel in tubes and in Minim. It helps properly positioning the bottle in front of the eye and guides the head in the right position. It provides sufficient support for shaking or trembling patients, because the Eyot® rests on the cheekbone and the forehead. In addition, the Eyot® provides full access to the bottle, tube or Minim, so that squeezing is not hindered. Because the Eyot® rests on the cheekbone and the forehead, there is little or no contamination from make-up or tears. It avoids contact with the eye, eyelid and eyelashes. At the same time, the Eyot® accommodates the physical limitations of the patient to the maximum extent possible. 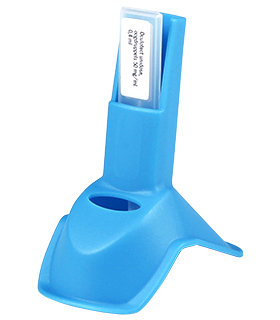 The Eyot® Minim is a plastic eye drop device for administering your eye medication in Single Unit Dose packaging (Minim). The Eyot® is a plastic eye drop device that not only fits onto plastic eye drop bottles but is also suitable for plastic eye gel tubes. Download your free manual with instructions for the Eyot® or the Eyot® Minim here. The manual is available in Dutch and in English. Start using this simple and effective eye drop device now!